USCIS has posted prepared remarks from the August 13, 2015 EB-5 Stakeholder Engagement. IPO Chief Nicholas Colucci discusses EB-5 program statistics, the new EB-5 InTouch series of engagements and a recent China trip, EB-5 protocols, the new IPO compliance team, and GAO report recommendations. IPO Deputy Chief Harrison remarks on processing workflow and times (and exceptions to the FIFO principle), and announces an EB-5 Interactive Engagement on September 17, 2015 that will discuss I-924A filings. 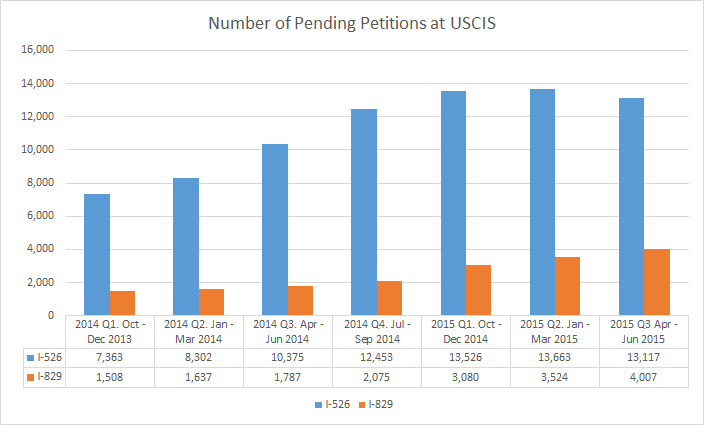 The Q3 petition processing statistics that I reported last week have now been officially posted on the USCIS website. Here is a bonus chart just showing the number of pending petitions. The I-526 trend finally shows some good news last quarter, while the backlog of I-829 petitions continues to grow.